What’s startling about the revue is how uncannily it feels like 1970s broadcast television, the sort of variety show where you might see the Osmonds or Bob Hope — only here you’re side by side with families snuggled under blankets against the chill, some with tubs of popcorn in their laps. 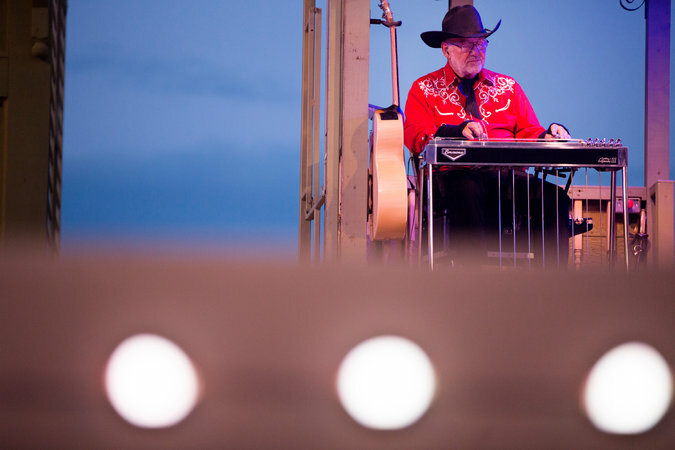 Roger Rettig, who has performed in the show for 13 summers, playing the pedal steel guitar. The national anthem is part of the revue’s first half, with the audience standing to face a flag. The surprise, when I looked around, was how few people were joining in the song. Most of what we heard was the cast, their voices as heavily miked as they are in the rest of the show: a necessity given the wind, which makes sound a different challenge every night. The horses in the Medora Musical make their appearance early on, in a vignette depicting Roosevelt’s charge at the Battle of San Juan Hill. But the production’s one truly jaw-dropping moment comes later when a horse and rider climb the bluff beyond the stage in the dusk and are lit atop it against an evening sky. It’s an extraordinarily dramatic use of landscape — and the kind of visual that makes you wonder what potential the show could have if seriously deep-pocketed producers ever took the reins. But then it might not be the Medora Musical anymore. In the welcome center off the parking lot, alongside the souvenirs (the most adorable, hands down, being the Official Badlands Teddy Bear, with fringed jacket and pince-nez), is an endearingly homely model of the amphitheater the way it used to be, before reconstruction in the early 1990s. “It was dirt paths with benches that were not level,” recalled Mr. Wollan, who grew up going to Medora in the summertime.